Nuclear techniques are critical in the exploration for oil and in the control of oil wells, and intrinsic to uranium exploration. 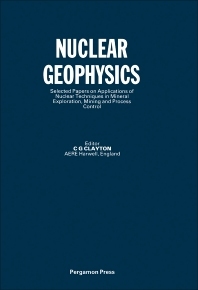 This volume includes comprehensive review articles by internationally eminent scientists and engineers, on a wide variety of techniques and applications in the area of nuclear geophysics, including important new techniques and equipment being developed for use in the metalliferous and industrial minerals industries. Also included is a description of neutron interaction methods now being introduced to give a total elemental analysis, calorific value and ash-content, on-line.